Dark, bleak and still. 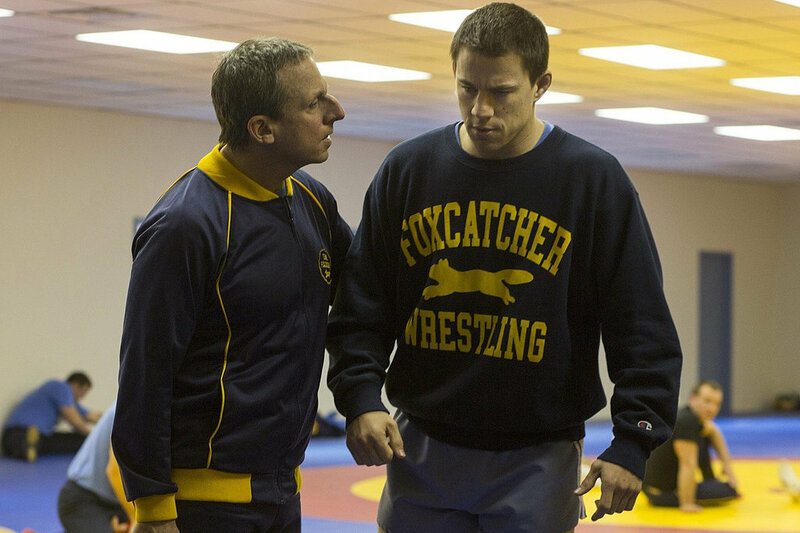 These are three words that categorize the feeling that permeates Foxcatcher. I would be hard-pressed to say people would “enjoy” this film in the classical sense. Despite the fact that both main characters, Mark and David Schultz (Channing Tatum and Mark Ruffalo), have won Olympic gold medals for wrestling they seem quietly reserved and sort of sad. And that’s basically how the film makes you feel. They wordlessly go through their training exercises, and Mark, in particular, seems to do nothing but sit around wait for the next training session. At least, that’s what we’re shown. That is, until he meets John du Pont (Steve Carell), the filthy rich oddity that causes the lives of these two brothers to change forever. The film at first gives you the sense that it’s about Mark’s journey back to the Olympic podium, but really it’s about the pairing of the Schultz family with the du Pont world and what becomes of the two of them as a result. It is safe to say neither family will be the same by the end, especially if you know the facts of the actual events this film is based on. Mark and John are presented as similar people: Mark trains as a wrestler as a way of impressing while separating himself from his older bother, meanwhile John focuses his attention on becoming something his disapproving mother never allowed him to be and something he never had; an athlete and a father-figure. The thematic tension lies in the struggle between their internal similarities and their external differences. Both men wish to be their own man. Mark has the physique and the freedom (no attachments) to be an Olympic champion. While John lacks these qualities, he has the means and the power to attain his goals. The way the two characters play off each other is basically the story. There is a permeating sense of dread throughout the film, which is embodied in the character of John and played patiently creepy by Carell. There is never a moment between John and the Schultz’s where you feel John isn’t a predator of some sort, and perhaps that comes partially from Carell’s “Hannibal Lector”-esque performance and partially from the way rich people are generally portrayed in film. We’ve seen hundreds if not thousands of movies that center around the rich being naughty with their wealth and sophistication. I think it’s worth pointing out that du Pont isn’t evil simply because he’s rich, but rather because of his upbringing. There are a few scenes where he interacts with his mother, including one particular non-verbal interaction that tells a bigger part of their history, that basically reduce him to a child seeking his mother’s approval. This is much the same way Mark seeks the approval of his brother while simultaneously wishing to be his own person. This psychological angle is the strength of that one character and the weakness of the rest, as there are really only two characters with any depth. Tatum plays Mark as a one-note, somber child waiting to throw a tantrum. He is a child who is physically able to act-out, but rarely does, instead choosing to brood and pout in his room with his toys. There is also a team of wrestler’s that assemble on the du Pont residence that somewhat resemble a stable of horses, which is a common metaphor shown in several places during the film, but are not shown as real people. David is the only character other than John that has a multi-dimensional motivation, as he is a family man and he wishes to help his brother on top of honoring his employer. Again, it’s tough to say I “enjoyed” this movie as much as I would say it was a decently compelling story that’s driven by Carell’s performance and the character of John du Pont. If director Bennett Miller had fleshed out the rest of the cast it would be a better watch, but it’s still a solid movie soaked in dread and bleakness. Adjust your expectations accordingly.